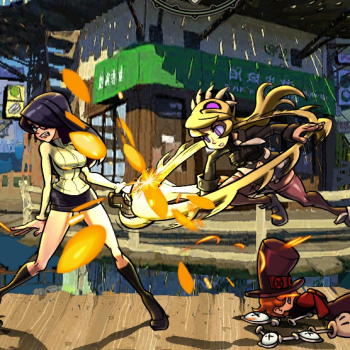 Skullgirls design director revealed that Konami has put in a request for the game to be delisted from Xbox Live and PSN. Skullgirls developer Lab Zero and publisher Autumn Games have had somewhat of a... rocky relationship with co-publisher Konami, which ended in a messy breakup. Konami is not taking the news very well, as Skullgirls design director Mike Zaimont recently revealed during a Twitch stream that the publisher has put in a request to Sony and Microsoft to pull the current version of the game from Xbox Live and PSN. Konami co-published the game alongside Autumn Games on Xbox Live and PSN everywhere outside of Japan, and as such has every right to request the game be pulled. Lab Zero and Autumn are working on a new version of Skullgirls that will be published without Konami's help, but if they are unable to get through Sony and Microsoft's approval process by December 17, the game will disappear from its respective online stores until after the Christmas holidays. If you already own the game, you'll still keep it and be able to play it offline, but new players won't be able to purchase the game, and it's unknown if the game's online multiplayer will still function if it becomes delisted. Zaimont says that he and his team at Lab Zero didn't find out about Konami's request until after it had already been approved by Sony. This seems like a very puzzling and jerk move from Konami, as they would still be able to make money from the PSN and Xbox Live version of the game for as long as it stayed up. It feels like it was done just to spite Lab Zero and Autumn.